Pointe-A-Pitre/Philipsburg – What was dubbed as the most important meeting of the region, a gathering of press, airline officials, travel agents and government officials came together in Pointe-A-Pitre, Guadeloupe, for the official launching of the CaribSKY alliance between WINAIR, AIR ANTILLES and LIAT. An ambitious project with the aim to ease air travel throughout the Caribbean, as described by Romain Hordel, the Sales and Marketing Manager for Air Antilles during his opening speech at the event. The question that immediately comes to mind is whether this CaribSKY alliance can save Caribbean regional travel. A partnership between Winair and AirAntilles is understandable given the fact that these two airline companies have been working together since 2014. It makes perfectly good sense for a Dutch airline company and a French airline company to partner together with St. Maarten/Saint Martin being both French and Dutch and cooperation between the two nations has been common practice for hundreds of years. However, that LIAT – a English Caribbean company – would sign up for an alliance with a Dutch airline company and a French airline company is unexpected, unusual to say the least. Can this alliance work? And if it works, can it last? And if it lasts, can it increase inter-Caribbean travel as its lofty goal at its conception is? Let’s analyze the potential of this partnership. But first, what are the facts of this joint cooperation? 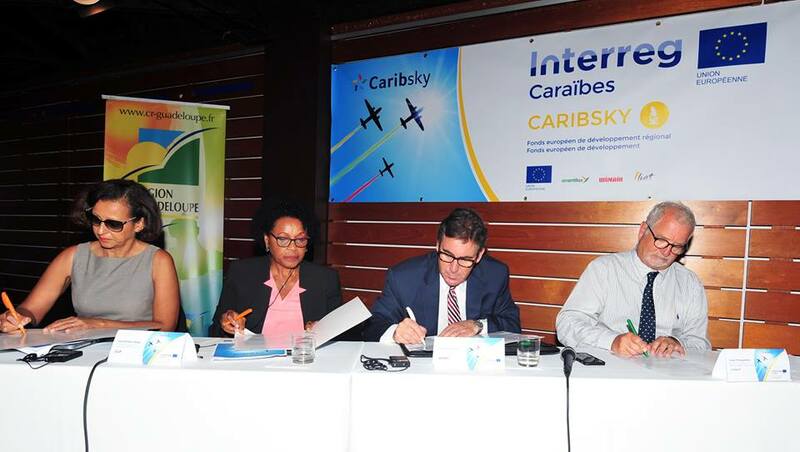 According to the press release handed out during the project launch on Tuesday, April 17th, 2018, at the Creole Beach Hotel in Gosier, Gaudeloupe, the CARIBSKY project, supported by INTERREG, is a collaborative project aimed primarily at optimizing air travel in the Caribbean area, based on a brand new network of the aforementioned interconnected airlines, which should ultimately foster free movement of persons and boost economic growth. Work together towards creating a product spectrum more specifically tailored to travellers’ needs, via the networks. The CARIBSKY project is co-funded by the INTERREG Caribbean programme for a total budget of 4,670.000 euros, including 1.8 million euros as part of the European Regional Development Fund (ERDF) and 417,500 as part of the European Development Fund (EDF). The balance is self-financed by the project’s partners Winair, AirAntilles, LIAT and Discover Dominica. The project will be executed over a three-year time period. CARIBSKY aims at sharing each airline’s expertise, connecting networks, optimizing flight programmes and bringing teams closer together. The ultimately goal of this project is to provide all Caribbean passengers with access to all Caribbean ports of call in a single ticket. AIR ANTILLES, as the designated project leader, is a French airline company based in Guadeloupe. The airline company was launched in 2002 and is therefore a relatively young company. It provides inter-island flights between Guadeloupe, Martinique, Saint Barths, Saint Martin, St. Maarten, Barbados, Dominica, Puerto Rico, the Dominican Republic, Saint Lucia and Cayenne in French Guyana. The parent company is CAIRE company and operates Air Antilles and Air Guyane. Together the group has a fleet of 12 turboprop aircrafts. The other airline partners in this venture are LIAT and WINAIR. LIAT was established in 1956 and presently serves Anguilla, Antigua, Barbados, Dominica, Guyana, Grenada, Guadeloupe, Martinique, San Juan, St. Kitts, St. Lucia, St. Maarten, St. Croix, St. Thomas, St. Vincent, Tortola and Trinidad. WINAIR on the other hand is a small regional carrier based in St. Maarten and operates daily flights out of the Princess Juliana International SXM Airport, serving Saba, Dominica, St. Eustatius, Saint Barths, St. Kitts, Nevis, Antigua, Tortola and Anguilla as well as Guadeloupe, Curacao and San Juan (Puerto Rico) in a codeshare agreement with Air Antilles. OBJECTIVES CARIBSKY: A project aimed at optimizing and simplifying inter-Caribbean travel. To provide them with easier travel across the entire Caribbean area based on more connection options, increased traffic fluidity and lower prices. To reduce isolation based on a greater connection options and easier access for inter-continental passengers. Based on optimized productive assets and enhanced synergy. CARIBSKY is a programme co-funded by the INTERREG Caribbean programme, as part of the European Regional Development Fund (ERDF) and supports cooperation initiatives addressing shared regional challenges in view of strengthening sustainable economic growth in line with territorial specificities, in the Caribbean area. The Guadeloupe Regional Council acts as the managing authority for this fund. It was devised to support projects involving stakeholders located in the Outermost Regions (ORs) of Guadeloupe, French Guiana, Martinique and Saint Martin and partnering with other Caribbean establishments – which accounts for nearly forty third-countries or Overseas Countries or Territories (OCTs). This European Territorial Cooperation (ETC) programme aims at upholding challenges and issues shared by Caribbean countries and territories, based on financial support to win/win projects. It counts with a total budget of 85.7 million euros including 64.2 million in ERDF funding distributed among all of the programme’s axes, as well as 2.9 million in EDF funding (European Development Fund) for Caribbean partners – with the Guadeloupe Regional Council acting as the fund’s managing authority on behalf of CARICOM/CARIFORUM. Competitiveness, innovation, employment, economic diversification, growing business opportunities in the area. Strengthening natural disaster response capabilities. Protecting and promoting natural and cultural environments. Providing a joint response to public health issues. Supporting initiatives aimed at fostering renewable energies. Strengthening human capital (training, mobility, language learning). The CARIBSKY project operates as part of the programme’s first axis, in view of the strengthening in a sustainable and inclusive fashion, the competitiveness of Caribbean businesses, as crucial wealth and job creators. ANALYSIS: CAN CARIBSKY SAVE CARIBBEAN TRAVEL? This is not the first presentation of a Caribbean alliance under the name “CaribSky”. There previously was a Caribbean alliance called CaribSky made up of LIAT, Winair, Air Caraibes, Trans Island Airways, Carib Aviation, Tyden Air and CAT. There was also a Pan Caribbean Alliance (PCA) whereby St. Maarten’s Winair, Curacao’s Inselair, Suriname’s SLM (Suriname Airways) and the Venezuelan Conviasa attempted to create a network of seamless connections on all their flights and to offer these connections as one flight on one ticket. If Tuesday’s experience on the 17th of April in getting from Grand Case Airport to Guadeloupe with Air Antilles via Antigua is any indication, the three partners in this 2018 version of the CaribSKY airline alliance surely have their work cut out for them. Jean-Michel Jumez, the Deputy Prefect of Guadeloupe, rightfully pointed out that harmonizing the different corporate cultures is key in this project for providing unified Caribbean travel. With three jurisdictions, three languages, three companies, each with their own distinct identities, histories and cultures, the challenge to find common ground and achieve harmonization will be daunting. That is the first challenge to overcome. Then there is the issue of harmonization of the respective airline reservation systems of the airline partners in the CaribSKY alliance. Getting their separate IT and reservation systems to work together is a prerequisite for a successful implementation of the one ticket, one flight, one itinerary programme. WINAIR uses SITA, AIR ANTILLES uses TTI and LIAT uses Navitaire. Just the costs alone to build bridges between these systems in order to communicate properly is limiting. Unclear is whether the funding provided by INTERREG will involve IT development and harmonization. This is a question for Gilles Bajazet, the director of the INTERREG Secretariat, who stated during the launch that transportation and the movement of goods and people in and around the Caribbean is a major issue and requires Caribbean-wide cooperation and hence the need for EDF and ERDF as funding sources for the CaribSKY scheme. The next issue to overcome is the cooperation between the various civil aviation authorities in the Caribbean. A Caribbean aviation alliance needs to be able to circumvent the different aviation jurisdictions in the Caribbean region. The CARIBSKY network will encompass the Dutch, French, British, US and other Caribbean civil aviation jurisdictions (the BVI and Anguilla comes to mind). The challenge will be for the respective governments of these territories to assist in creating one unified aviation territory. For that cooperation is imperative. Finally, the issue of airport fees and taxation. To show how thorny this issue is, a prickly debate about airport fees and taxes broke out during the question and answer part of the launching event after the signing of the CaribSKY alliance by the partners involved. It was stated that taxes were amounting to 50% of airline ticket costs and ever increasing at an alarming rate of 50% on average each time. The last word on this issue has not yet been spoken. I will be making an in-depth analysis of this in a subsequent article as well. Here is another quote I would like to share with you the reader. The latter issue regarding the rising insurance premiums anno 2018 is a direct result of the devastation caused by hurricanes in 2017 throughout the Caribbean, especially in the Northeastern region by hurricanes Irma, Jose and Maria. This is also resulted in a setback in the discussions surrounding the CaribSKY partnership as was pointed out by LIAT’s CEO Julie Reiffer-Jones. Winair’s CEO, Michael Cleaver, had explained that the search for a Caribbean alliance besides the existing partnership between his airline company and Air Antilles had started back in 2014 during a meeting in his office in St. Maarten. Serge Tsygalnitzky, CEO of Air Antilles, concluding words are fitting for this analysis as he pointed out that despite the traffic rights issues with no open skies agreements in place and no 5th freedom rights between various territories in the Caribbean, the three companies seeking to work together with their own identities yet working autonomously within their respective Dutch, French and English jurisdictions, achieving a single ticket, including a common loyalty programme, will have significant benefits for the customers. Namely, more flights, more connections, more frequencies, all at a cheaper price. At least, that is the lofty goal of this CaribSKY alliance. However, in conclusion, to save Caribbean travel, the challenges that need to be overcome are daunting. Integration and harmonization of IT and reservation systems; proper marketing; cooperation between airports; adequate financial support; addressing regulatory issues; reducing taxes; and solving traffic rights issues – not to mention the maintenance, training and staffing issues – are all hurdles and objections that will need to be overcome before a successful alliance can be achieved with one ticket offering seamless connections and streamlined itineraries for Caribbean travelers in the CARIBSKY network. Nevertheless, the signing of the CARIBSKY agreement is a good start in the right direction. Keep an eye on their website at www.caribsky.com for future developments. 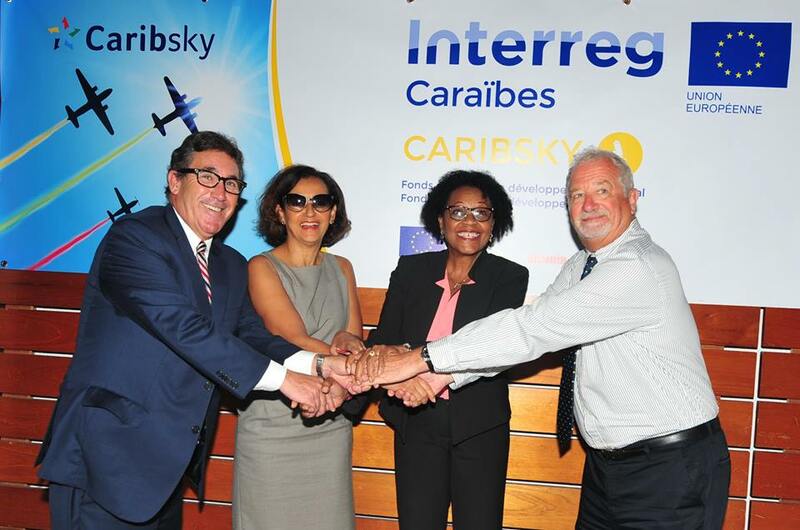 Photo captions: The signing and celebrating of the CaribSKY alliance launched by Marie-Luce Penchard (Vice President Region Guadeloupe on behalf INTERREG), Michael Cleaver (Winair), Julie Reiffer-Jones (LIAT) and Serge Tsygalnitzky (Air Antilles). Photos by Milton Pieters.